Specific details are required for purchase orders. More Information & Sample P.O. The Utility Factory accepts purchase orders from most U.S. corporations, U.S. schools, and U.S. State or County government agencies. Please read the following terms and conditions carefully before sending a purchase order. While we do not charge a fee for processing simple purchase orders additional charges and fees may apply for complicated purchase orders, or special shipping requirements. All products bought by purchase order must be shipped to a US destination. 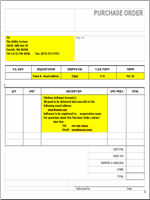 We can not accept purchase order numbers over the phone, or purchase requisition forms. We can not accept purchase orders from outside the United States. All international orders must be prepaid. We must receive a copy of the purchase order before we can process your order. Payment terms are net 30. Purchase orders must indicate the email address to which the software is to be sent and the fact that you are requesting electronic delivery (so your accounting department doesn't hold up payment waiting for delivery of a product you already have).